Millennials are known for having an approach to the workplace that differs from the generation before them. Reports coming out this month detail a related phenomenon: a high percentage of millennials (25%) plan to leave their organization by the end of the year, and 53% see themselves as open to job prospects. 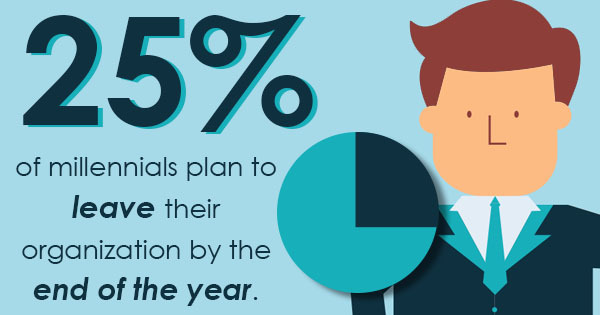 About 57% of companies agree retention is an issue. According to the fifth annual Global Millennials study, a major reason stated for leaving was feeling like their leadership skills were being developed. As companies have become increasingly flat in the U.S., employees have discovered that there is less of a ladder to climb up in their individual companies, leaving them to seek opportunity elsewhere. In fact, executive search consultants say that almost 3 million workers chose to leave their jobs at the end of June 2015 -- a 25% increase compared to the previous two years. How can you improve your talent acquisition and retention by appealing to millennials? Here are three tips from executive search consultants. Numerous experts in human resource staffing have agreed: it helps to take a "coach" mentality rather than a pure "boss" mentality. Millennials aren't looking for a participation trophy, but they do want consistent feedback on how to improve. Feedback throughout the year can help millennials feel in the loop about how their performance is viewed. There's always a few employees willing to work 60 hours a week to impress the boss. The majority of millennials, however, are looking for balance. This includes 40 hour work weeks, benefits and -- when possible -- the ability to shorten their commute. If it's possible to offer your employees the option to work from home, do it. Human resources consultants say that in many cases, employees are actually more productive when they work from home -- not less. Have an Engagement Strategy Traditionally, companies have often taken the approach of having employees compete against each other. Millennials, though, often prefer a more collaborative approach to working, seeing themselves as pitted against the company's competition instead. Keep in mind that what worked for baby boomers isn't going to necessarily work for millennials. Creating an environment where your employees are constantly working together to come up with new ideas will also make your company a better pitch when it comes to talent acquisition management firms trying to net new employees for you. Executive search consultants can help you find millennials for your workplace, but if you don't make it a good work environment, they'll be leaving you sooner than later. Keep these three tips in mind for keeping a great workplace.